Priory is a quartet hailing from that lovely pocket of the Pacific Northwest, Portland, to be exact, and they make the kind of songs one would expect to hail from Portland: folky pop songs. What sets Priory apart from their contemporaries, or such a group as Band of Horses (that was my first impression upon first listen)? Oh, just their lovely vocal melodies weaved in; and maybe their way of crafting super catchy sing-along songs stuck on repeat in your head, like Kings of Troy, Lady of Late or White Coat. And how could I not mention the touch of warm synth sounds? I can think of a few bands who have infused their folky songs with synthesizers, but I haven’t heard a folky band from up North, without trying to be cutesy, adding synths to their slightly melancholy sounding songs in quite some time, so it’s fair to say that this self-titled piece is quite a breath of fresh air in terms of the genre of indie pop folk (if that’s even a genre). Most will be quick to judge their sound and write them off as another indie-folk band, but it’s the poppy sound that truly sets them apart, making you want to keep listening. Maybe it’s because I know where this band comes from, but I can’t help but to feel compelled to take this album along with me on a hike through Runyon Canyon, or some other lovely hike trail here in Los Angeles (yes, we have quite a collection of lovely hiking trails here). This album pairs well with a lovely, foresty setting and comfy hiking shoes, and since we have plenty here in LA, the warm embrace of the sun to balance out that poppy element I can’t stop talking about. I have to admit I was hesitant to spend time with South African alternative rock band’s fifth album. This hesitance derives from my previous accidental listenings on small town rock radio and the fact they they toured with my least favorite band ever (whom I will leave to your imagination). 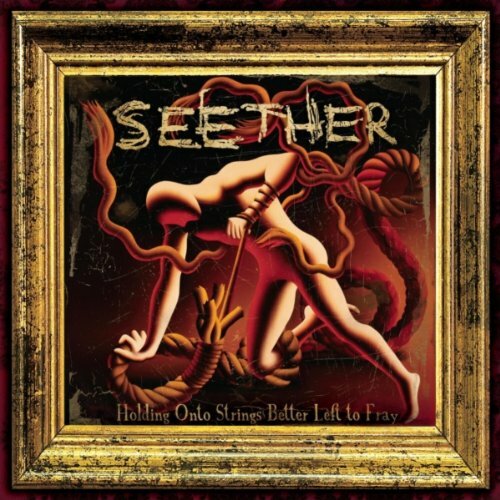 After spending time with Holding on The Strings Better left to Fray, I am reminded why I feel this way but was given a chance to find a glimpse of understanding towards the appeal of Seether and bands like them (whom I will leave to your imagination). Seether, particularly front man and guitar player Shaun Morgan has the ability create a wall of sound with power chords, distortion and guttural singing backed up with heavy yet primitive drum and bass playing. This style is understood as “post-grunge” which I don’t recognize as a proper genre title because I am still in denial about grunge ever dying. This affect is easy to listen to when your into this style. It fills up your brain via ears with sweet shiny nothingness. The album begins with “For Cue” which starts heavy, flashy and contains ridiculous lyrics. The style is continued for some time until the single “Country Song” which is slightly charming in a hillbilly bar in the deep south kind of way. More mindless lyrics that conveniently rhyme are sung in the throaty manor for the remainder of the album which contains little diversity. The song “Down” is the strongest as it contains more complex instrumentals that compliment Morgan’s voice . That stated, if you like Seether this album will most likely fulfill your Seethery senses as the solid sense of the band is carried all the way through the album. Philadelphia’s The War On Drugs are releasing their excellent sophomore album, Slave Ambient, on August 16th on Secretly Canadian. Slave Ambient is a brilliant 47-minute sprawl of rock ‘n’ roll – every song instantly identifiable; a latticework of ideas and energies building into mile-high rock anthems. The War On Drugs will be touring extensively in support of this new album, at times re-creating and at times re-interpreting the fuzz-fueled awesomeness of Slave Ambient. For anyone who recently caught them supporting Destroyer in the states, or across the globe the last few years, you know what I’m talking about. For everyone else, now’s the time to find out! Catch The War On Drugs on their first run of dates right after Slave Ambient’s release. More dates to be announced in the coming weeks! We are pleased to announce, after playing just a few select dates this past May in support of his new album, WIT’S END, Cass McCombs will be doing an extensive North American tour this July. A full list of dates is below. Also, we have a brand new video for Cass McCombs’ “County Line,” produced by Malcolm Pullinger, directed by Cass, himself, and starring various locations across the South. Cass McCombs’ WIT’S END is now out on Domino Records. Saves The Day, the seminal band that helped create and define the emo pop punk genre, returns with their new album, Daybreak, on September 13th through Razor & Tie. The song “Living Without Love” from the new album is available on iTunes for purchase. Pre-Order the album now and get two free tracks instantly – “Living Without Love” and “Undress Me”. Various bundles available for purchase. Saves The Day continues to tour and is currently on the road with The Get Up Kids (Dates Below) with future tour dates to be announced soon. Produced by Marc Jacob Hudson (Two Tongues, Chiodos) and Saves The Day, the much-anticipated Daybreak is the final piece of a three album concept trilogy that started with the 2006 release Sound The Alarm and the 2008 release Under The Boards. Unlike the discontent and remorse ofthe previous two albums, Daybreak is eleven tracks of growth, acceptance and evolution. “Daybreak wraps up all the turmoil and misery of the previous two albums and transcends the pain by facing the fear and angst that comes in this life and turning it into growth and positive change,” explains singer-guitarist and songwriter Chris Conley. Saves The Day formed in 1997, releasing their debut album Can’t Slow Down in 1998 and followed by Through Being Cool in 1999. 2001’s Stay What You Are spawned the memorable “At Your Funeral” as the band continued to evolve and grow. 2003’s In Reverie peaked at #27 on the Billboard Top 200, becoming the third Saves The Day album to chart on the Billboard Top 200. In 2006, the band began its concept trilogy, which is now being completed in 2011 with Daybreak. Saves The Day is Chris Conley (Vocals/lead guitar), Arun Bali (Guitar), Rodrigo Palma (Bass) and Claudio Rivera (Drums). Often cited as one of the most influential bands of their time, Saves The Day has stayed at the forefront of the emo punk scene for almost fifteen years. The Fervor invite you on a thrilling cat and mouse journey. With their villainous band mates hot on their tail, Natalie and Ben Felker elude capture in their vintage, plum sedan. Natalie’s charming bellows contrast the song’s tormenting rock n’ roll vibe, which gives both the tune and the plot a quirky veneer. Get “Crazy For the Feeling” on BaebleMusic.com now! The BOMB Festival is a relatively new event and it has be consistently gaining prestige. The focus is on mixing local music with nationally recognized acts. The following photographs were taken on Memorial Day weekend by Chloe Donaldson. Sondre Lerche is gearing up for the upcoming release of his self-titled album out June 7th on Mona Records. In support of the album Consequence Of Sound praises for “showcasing Lerche’s best traits as a songwriter,” Sondre is currently on a North American headlining tour. Tour dates below. With an overwhelming response, Sondre’s new album will be Amazon’s “Deal Of The Day” on June 7th and radio stations across the country are jumping on first single “Private Caller.” In addition, Sondre will perform on KEXP, KCRW, KFOG and WNKU, among others, throughout June. Stay tuned for more details. An artist The Los Angeles Times calls “one of the most talented names in contemporary pop” with “a live performance that should not be missed” Sondre is extremely excited to hit the road and premiere his new songs. To get fans excited for the upcoming dates, Sondre is streaming single “Private Caller” and new song “Domino.” Links below (approved to embed). We are incredibly excited to announce that Porcelain Raft, aka Rome native Mauro Remiddi, has signed with Secretly Canadian, the venerated label responsible for launching the stellar likes of Antony and the Johnsons, Here We Go Magic and Yeasayer into the wider consciousness. Currently writing and recording his debut LP, Remiddi attracted attention and acclaim in 2010 when he released his debut single, “Tip Of Your Tongue” and the “Gone Blind” EP, both on the taste-making label Acephale. Winning plaudits on both side of the pond (Pitchfork lauded the “intimate sounding, homespun guitar pop that seems to be in short supply these days,” while the Guardian named him their “favourite abstract-computer-kid-sings-heart-out of 2010”), Remiddi went on to support the likes of Blonde Redhead, Yuck, Perfume Genius and more, before leaving audiences at SXSW spellbound by his distinctive vein of ethereal, mesmeric love songs. A full-length album is expected soon, but for now, you can listen to the brand new track, “Amateur’s Feeling,” below. German electronic/spacerock explorers TANGERINE DREAM to present exclusive US performance. Punk/electronic iconoclasts SUICIDE to perform their legendary first album in its entirety. Electronic pioneer HANS-JOACHIM ROEDELIUS to perform solo. More CONCERTS, WORKSHOPS, TALKS, INTERACTIVE EXPERIENCES, ART INSTALLATIONS to be announced in coming weeks. Asheville, NC – AC Entertainment is proud to announce the initial lineup for Moogfest 2011, the annual festival of electronic and visionary music, celebrating the innovative spirit of Bob Moog, inventor of the Moog synthesizer. Taking place Oct. 28 – 30, in beautiful Asheville, NC, Moogfest’s Halloween harvest of musical delights builds on the tremendous success of last year’s reinvention of the Moogfest concept in the city that Bob Moog called home. This year’s Moogfest lineup highlights a remarkable synergy of classic electronic music pioneers, contemporary groundbreaking artists, and young upstarts who are further pushing musical boundaries. ‘70s innovators, including Tangerine Dream, Hans-Joachim Roedelius and Suicide, will present rare US performances as they join a lineup that includes the Flaming Lips, Passion Pit, STS9, Ghostland Observatory, Crystal Castles, Chromeo, Battles, Umphrey’s McGee, Mayer Hawthorne & The County, M83, Holy F**k, Matthew Dear, Twin Shadow, Toro y Moi, The Naked And Famous, Tim Hecker, Anika, Austra, Causing A Tiger, and Gold Panda, with many others still to be announced. The final Moogfest 2011 lineup will ultimately feature performances by over 60 internationally acclaimed artists in numerous venues throughout downtown, including the Asheville Civic Center Arena, the Thomas Wolfe Auditorium, and world-renown Orange Peel Social & Pleasure Club. The festival will also host workshops, talks, interactive experiences and art exhibitions and installations. Weekend passes for Moogfest 2011 will go on sale on Saturday, June 4, at 12 Noon Eastern exclusively at www.moogfest.com. Visit the official festival website, www.moogfest.com, for more information.